Grout shafts in Soho - Crossrail . For information about the Elizabeth line please visit the Transport for London website. Work to prepare for the construction of four grout shafts in the roads around Soho Square has begun. 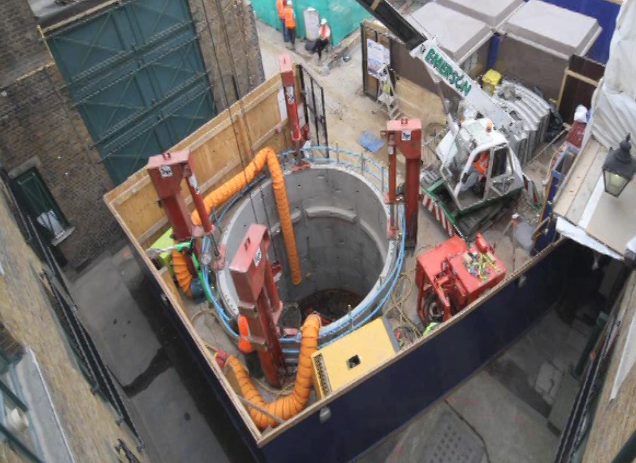 Grout shafts ensure that buildings are protected from any potential ground movement during Crossrail works by allowing engineers to pump grout (a cement-like substance) deep into the ground. Before construction of the shafts begins in spring, a number of utilities are being diverted away from where the shafts will be sunk. These diversions help to protect the utility services while ensuring that the shaft can safely be constructed to a depth of 17 metres. Once the utilities have been diverted, the shafts will be built in the road; this will require traffic measures to be in place to maintain access around the square. A video showing the building of the Bond Street shaft can be seen here. Three further grout shafts will also be constructed in Goslett Yard, Sheraton Street and inside the Dean Street worksite. All seven grout shafts are expected to be completed in 2012, in time for the arrival of the tunnel boring machines. The shafts will be in use during the tunnelling and excavation phase and a work site will be in place throughout this time.